Magdalene (pronounced "maudlin") College was founded in 1428 by Henry VI as a Benedictine hostel before becoming a constituent college of the University in 1542. The buildings show a diverse range of styles, representative of the College's growth from an ecclesiastical establishment into a centre of education. 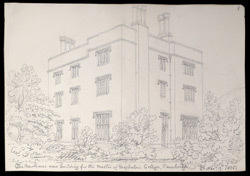 At the time of Buckler's drawing, the College was just escaping from financial pressures which had plagued it on and off over the centuries. This was usually due to the poor choice of Masters of the College - several of them had brought notoriety on the College for being convicted of high treason and executed!